Admins and teachers can view the deployments for a Gauge assessment. Deployments may be scheduled, live, closed or in draft. Admins can view all Gauge deployments for their institution. 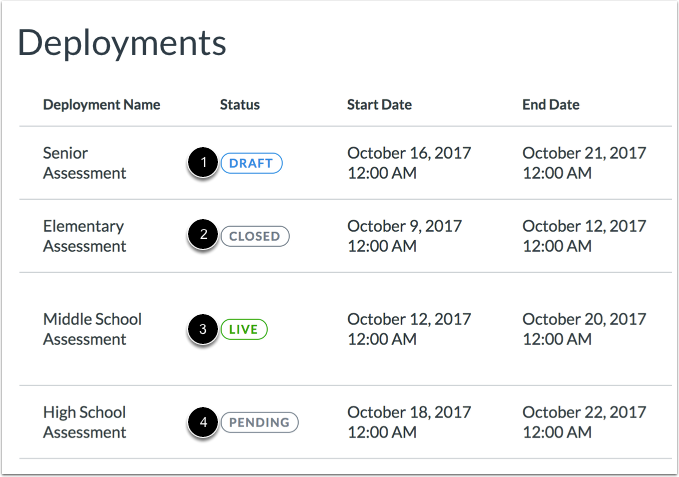 Teachers can view deployments for assessments they have created or assessments that have been deployed to students in their courses. On the Assessments page, find the assessment you want to view . To open the Deployments page for the assessment, click the Calendar icon . View the deployments for the assessment. For each deployment, you can view the status , start date and time , end date and time , results release date , and number of recipients . Draft: Deployment is created but has not been scheduled . Closed: Deployment date range has passed and deployment is no longer available to students . Live: Deployment has been deployed and is available for students . Pending: Deployment is scheduled to deploy at a future start date and/or time . To edit a deployment, click the Menu icon  and select the Edit option . You can edit the name , date range , release schedule , and recipient list  for a deployment. To save your changes, click the Save and Schedule Deployment button . 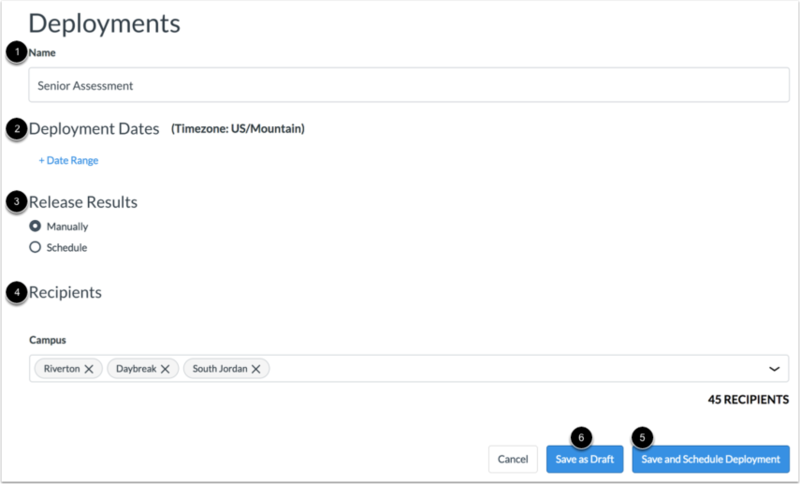 To revert a scheduled deployment to draft state, click the Revert to Draft button . To release the results of an assessment to students, click the Release Now link . To recall the results from a deployment that has already been released, click the Recall Results link . To archive a deployment, click the Menu icon  and select the Archive option . Archiving a deployment will remove it from the Deployments page. Previous Topic:How do I regrade an assessment question in Gauge? Next Topic:How do I view reports for an assessment in Gauge? Table of Contents > Admins & Teachers > How do I view my deployments in Gauge?